After a gunman killed 17 students at Marjory Stoneman Douglas High School on Feb. 14, the survivors of the shooting quickly mobilized to speak out against gun violence, inspiring a number of protests at high schools across the country. Students in Arizona, Colorado, the District of Columbia, Maryland, Minnesota, Montana, New Jersey and Washington state staged “walk out” protests as students left class at predetermined times and gathered elsewhere for a rally or demonstration. Some also participated in a “die in” protest, lying on the ground outside the White House. Still, some high school students may worry that participating in protests could lead to a suspension or other disciplinary action, which could jeopardize their college prospects. In response, a wave of colleges and universities around the country have issued statements of support for the students, saying that suspensions for peaceful protests will not affect admission decisions—a relief in particular for high school seniors who have already been admitted or wait-listed but have not yet committed to a school. They may have worried that college administrators could still reject their applications. On Monday, 12 of the 28 Jesuit colleges and universities in the United States had issued such statements, and Deanna Howes Spiro, spokeswoman for the Association of Jesuit Colleges and Universities, said more were likely on the way. On Tuesday morning, more than half of the Jesuit institutions had published statements, and by Wednesday morning, 22 of the 28 had joined in. Some schools, like Fordham University and Loyola University New Orleans, have stated more specifically that they stand with students against gun violence. Saint Joseph's University gave Ms. Howes Spiro the following statement which has not been published on the school's website or social media: "Engaged citizenship, along with care and concern for the global community, are values central to a Saint Joseph’s University education. To that end, acceptance to SJU will not be withheld from students who exercise their right to peaceful protest." Other Catholic universities including DePaul University, the University of Notre Dame, University of St. Thomas, Providence College and Salve Regina University have issued similar statements saying that peaceful protests will not affect admissions. A Catholic University of America spokesman tweeted that the university "supports students who stand up for their beliefs" but did not state whether punishments for peaceful protests would affect admission decisions. 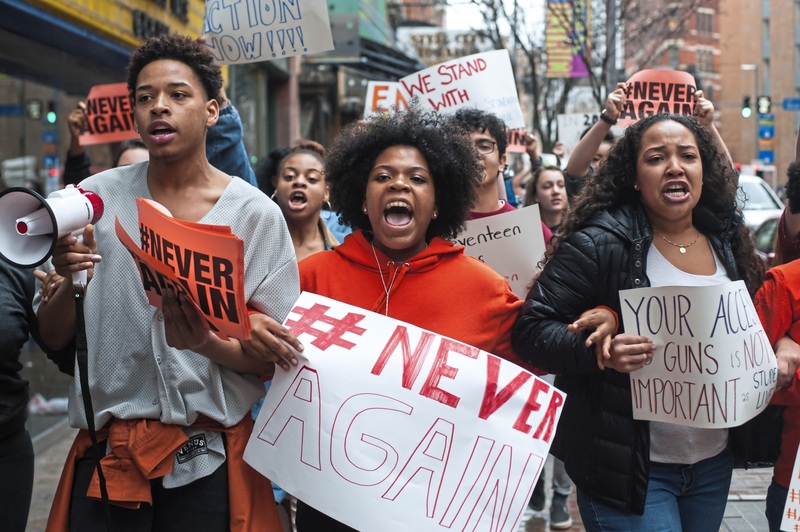 Women’s March Youth EMPOWER is planning a national walk-out protest on March 14 that will last 17 minutes, one for each student killed last month in Parkland, Fla., and another protest is set for April 20, the 19th anniversary of the shootings at Columbine High School in Colorado. The survivors of the Marjory Stoneman Douglas High School shooting are also planning the “March for Our Lives,” which will be held in Washington on March 24 concurrent with smaller marches in various other cities. This article was updated Feb. 27 and 28 as additional universities made statements. Why isn't my alma mater, Saint Louis University (SLU) on this list? Given the nature of academia today, I would think this type of protest would be a plus for admissions. How would these colleges treat someone who in an essay expressed a contrary opinion? This makes more than a dozen articles on this site about this topic in less than two weeks. I firmly support stringent gun control laws. According to the evidence, states that have strict gun control laws have significantly fewer people killed by gun violence. Of course, I know that there could be other factors which reduce killings from guns, but I still think that gun control laws are helpful. I also support more funding for mental health services, since I think it's safe to assume that at least some killers are mentally ill. For instance, Nikolas Cruz, who killed 17 people at the school in Parkland, Florida, had autism, attention deficit hyperactivity disorder, as well as depression. As someone who happens to have had depression at certain points in my life, I believe I can confirm that therapy as well as medication are helpful. I believe that assault weapons were banned by former President Clinton, and I support the return of this ban. At the very least, the age to purchase a semiautomatic rifle should be raised to 21 from 18. Even President Trump, who was endorsed by the National Rifle Association, has expressed support for this. As a retired Special Education teacher, I think it's a very poor proposal to permit teachers from carrying concealed weapons. I believe that teachers should do their primary task, which is to educate children. Although I favor the right to own a gun for hunting or for self-defense, I myself don't feel the need to own one, though I could have. When my Dad died in 1994, I found that he had a handgun in his bank safety deposit box. I immediately turned the gun into my local police department. I also think that it's a good idea for police departments to have gun "buy back" programs. I also question the need for one person to own more than one gun. Although the number of guns of any sort is hard to estimate, I've read estimates that in a nation of about 320 million people, there are at least 265 million guns. This means that there is one gun for each adult in the United States, which is think is far too many. Finally, I am glad that many Jesuit and presumably other Catholic colleges are advocating for gun control, or at least stating that high school students won't be denied admission of they engage in peaceful gun control protests. However, I also don't believe that a Catholic college should look askance at a student who writes an essay against gun control. Thank you for such a measured and balanced response, Tim. The college admissions departments of colleges cannot possibly be as efficient and detail-oriented as the student applicants believe them to be, the vast majority of the selection process based on grades and standardized test scores, and I would suppose computer models that process other objective factors. "Suspension" would be a convenient data point to exclude admission in a huge pool of candidates who are not really all that different from one another. What admission committee has the time to delve into the specifics for a suspension unless it is a candidate of superior grades and scores? If you're borderline, you're better off staying out of trouble of any sort. Colleges are looking for reasons to exclude candidates. Colleen Dulle is a Joseph A. O'Hare, S.J. Postgraduate Media Fellow at America.